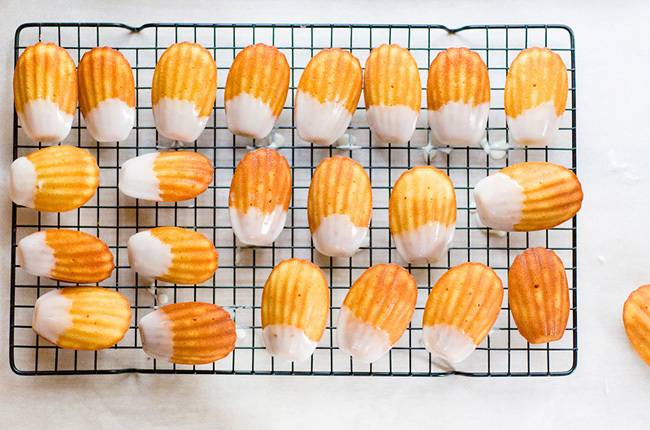 In spring and summer, I tend to want all the lemony things. Lemonade, lemonade pie, lemon bars, lemon orzo soup, and lemon cocktails. 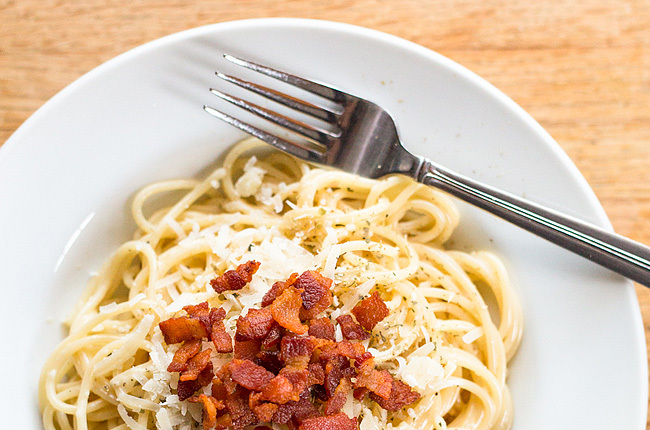 And I tend to throw lemon zest and lemon juice into everything I can. 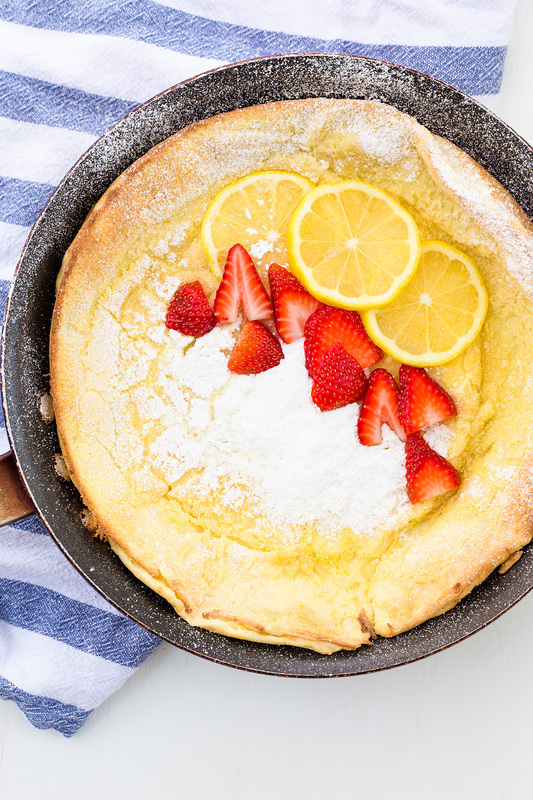 That’s how this lemon dutch baby pancake recipe came to be. First of all, I think I’ve mentioned it here on the blog before… I am HORRIBLE at making pancakes. But dutch baby pancakes? I am a star at making those. It helps that they are SO easy. 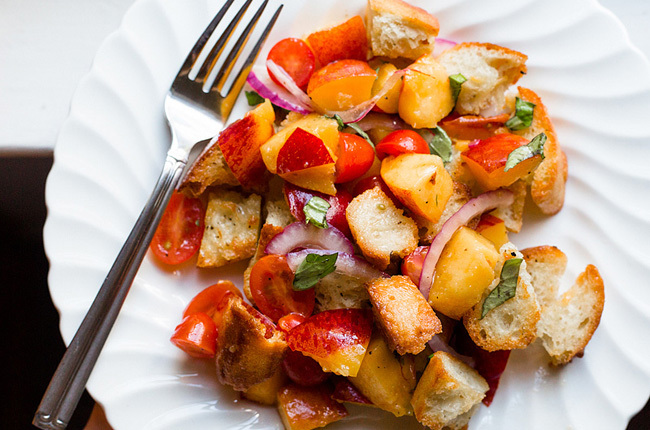 Basically you just blend up some ingredients, pour it into a pan, and let your oven do the work for you. My kind of meal. And this time of year, when strawberries are just starting to come into season, I use them whenever I can. 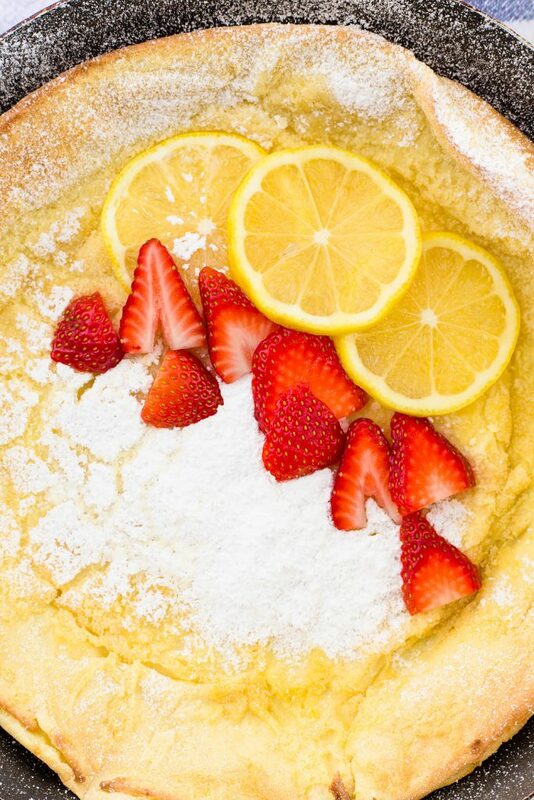 And they add a nice fruity freshness to the lemon dutch baby pancake recipe. Highly recommended. The pancake will puff up a lot in the oven. It’s pretty impressive. Once you take it out and squeeze the lemon juice on, it will deflate in the middle. Don’t be scared. That’s completely normal as it cools off. But I do like to eat it when it’s warm. So squeeze that lemon on there, make it rain powdered sugar, top with lemon slices and strawberries, and then slice up and dive in! Don’t skip the preheating and having the skillet in the oven for 10 minutes! I’ve tested it without, and it really works better when the skillet has the chance to heat up. Squeezing the lemon over the finished lemon dutch baby really ads a nice, fresh lemony flavor. Best eaten while warm. When this cools off, it’s definitely not as good. 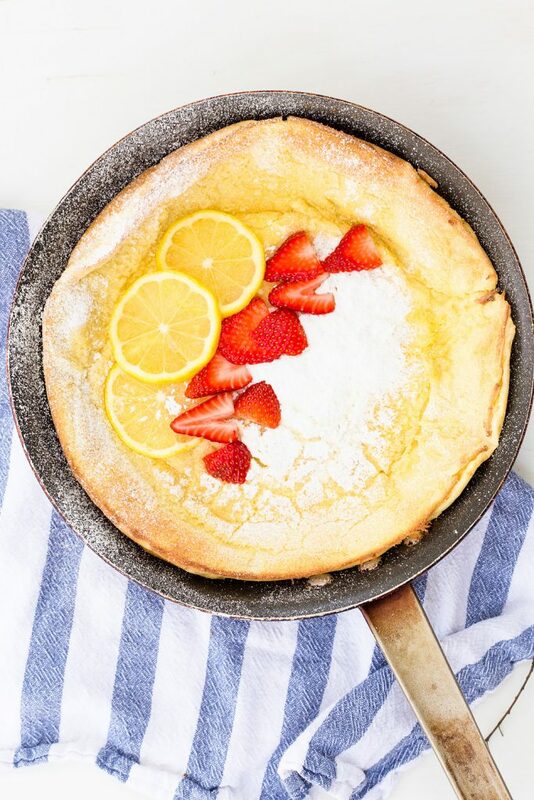 If you want to have some slices of lemon for garnish, slice a few from the lemon you used and set aside before squeezing lemon juice over the finished dutch baby. The dutch baby WILL deflate as it cools once it’s removed from the oven. Preheat oven to 400 degrees F. Once oven has reached the temperature, set timer for 10 minutes and place a medium, oven-safe skillet in the oven for 10 minutes. In a blender, add the flour, milk, and eggs. Blend until smooth. Add the zest from one lemon, sugar, vanilla extract, and salt. Blend again until combined. Once the 10 minutes are up, remove the skillet from the oven and add the butter to the pan. Swirl around until melted and skillet is coated. Pour the batter in the pan, and return to the oven for 25 minutes. After 25 minutes, remove from the oven. Squeeze lemon juice over the dutch baby, then top with powdered sugar, sliced strawberries, and lemon slices (if desired). You can remove it from the pan and put onto a cutting board to slice, or just slice straight in the pan like you would a pie. Enjoy!